At ISN, we value the growth of the intellectual, artistic and creative, as well as the physical and emotional dimensions. In addition to our academic programs, a range of stimulating activities both on and off campus provides opportunities for students to discover interests and life skills that go beyond the classroom. Students are thus encouraged to create, inquire, participate, perform, lead and produce; broadening their own experience and understanding of themselves, each other and the world we share. The curriculum in the Middle School offers a balanced learning environment where students explore eight areas of study and find their strengths. 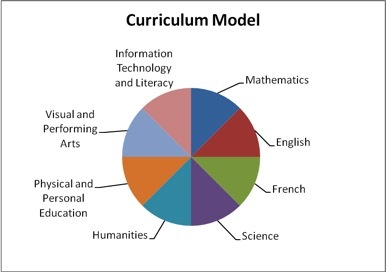 Courses become more subject specific, but are thematic in design to make connections across the curriculum, as in the PYP program. The IB Learner Profile is always kept at the heart of our approaches to learning and helps create valuable links between the Lower, Middle and High Schools. IN THE MIDDLE SCHOOL, THE CURRICULUM IS ORANIZED INTO 8 MAIN SUBJECT GROUPS AS SHOW BELOW. Middle School students follow an academic program that is organized in the same way throughout grades 6-8. This structure allows students to develop confidence within a familiar framework and provides for the reinforcement and spiraling acquisition of skills and knowledge. Students become increasingly autonomous as they move towards the close of the Middle School Program. This very special moment is highlighted by a grade 8 graduation ceremony where students’ learning is celebrated through portfolios of exemplary work and achievement awards, shared with parents and Faculty. Students typically study the following subjects throughout Middle School. In addition to its academic program, ISN values the emotional and social needs of the child. The Middle School provides regular opportunities for students to engage in activities with a primary focus on collaboration across the age ranges and lead to a heightened knowledge of self and others. The activities include student-led assemblies, talks by outside speakers, special focus days arranged around a theme and day or residential trips. Recent themes and subjects that Middle School students have been exposed to are Children’s Rights, Anti-bullying, Earth Day, Semaine du Goût and International Book Day. These days are designed to raise awareness in global and cultural concerns and to address issues such as respect, self-control and making informed choices for a healthy life-style. Other activities are organized and promoted by the Middle School Student Council, made up of two elected representatives from each homeroom group. These activities include fund-raising efforts such as bake sales for charities as well as organizing a social agenda that includes evening dances and spirit days. High School CAS students and the PTA often provide support to the student council to bring these activities to life.